Story - 5: I loved this story. And I am so glad that I did because I've been waiting for this story to be published for over a decade. I remember Marv Wolfman talking about the fact that he was working on a Superman story back in 2006 and was convinced that it would never see the light of day. Also, I was nervous because this is an origin story. We've gotten a lot of those over the past ten years or so, both in comics and on film. Did we need another iteration of that story? How would it compare to the others? Would it be radically different, or would it stick to the themes of fear and alienation that JMS' SUPERMAN: EARTH ONE, Geoff Johns' SUPERMAN: SECRET ORIGIN, the film MAN OF STEEL and the version of Superman that was introduced during The New 52 all played with to one extent or another? Let's take those questions in order. This isn't a hot take on the stories I just mentioned but I think we needed a version of the story that was a little more traditional. I liked parts of those four origins and would never tell anyone that made those stories the rock their Kryptonian church was built on that they were wrong to feel that way, but to me they focused more on the darker implications of who Clark is as a character. The alienation Clark feels because he's different and the fear the populace might feel upon learning that there was a man who could fly, was really strong, seemingly invulnerable and could shoot lasers out of his eyes. Superman was heroic and they all got to where they needed to get to, but to me there was always a sense of dread. A feeling that Superman became a hero despite his own doubts and some of them were just really dour. This is one of the most human takes on Clark Kent I have ever seen. I liked this Clark and was rooting for him. He was nervous and unsure of how to best help people and doubted himself, but in the end, he pulled out of that dive and became the hero he was meant to be. Wolfman created a very real world for Clark to exist in and I liked that Clark didn't get off the bus and immediately start working for the Daily Planet. That was one of the elements of The New 52 that I liked the most. Clark had to earn his place at the table and while there are ethical problems with getting in the door with a story about himself, I think Wolfman did a great job of establishing Clark as a contender in the final act when he approached Lois about the Lex revelation. This leads to the second question; how does this compare to the other versions we've seen over the past decade? It stands apart but shares the better aspects of those origins. The relationship Clark had with his parents was great, but then again, I'm a mark for the Kents living into Clark's adulthood. Lois is a central figure (and her introduction into the story was amazing) and like the other origins she's smart, assertive and likable. While I honestly prefer this take on Lois and Perry and Metropolis and Lex Luthor, I can't say that it is better than the other origins I mentioned. It's just more my speed. It's what I want to see in this sort of tale. The fact that Superman really doesn't appear in the story is even more miraculous because I was never clocking time until the big moment happened. This is the new Superman origin I've been waiting for. Wolfman did play with the idea that people would be afraid of Superman. He also played with the feelings of uncertainty and insecurity Clark felt on how to best use his abilities. The difference, to me, is that Wolfman never got lost in those themes. I think that the writers of the other versions of the origin that I mentioned focused a little too much on the angst Clark would feel and didn't do the best job of showing why he would eventually become Superman. Again, they all got to that point and, as I wrote before, I liked parts of them but Wolfman not only stuck the landing, but his launch and his routine were perfect as well. I am so glad that this story was finally published. I'm glad that people are getting a chance to read it. I'm glad I have another option for Clark's early days that I can go to and feel at home. This is one of the best stories of Superman's early days. Ever. Art - 5: The art in this special was amazing. Castellini drew an extremely realistic world for Clark to inhabit, which made him seem that much more special. The backgrounds and cityscapes were dense, but the story was never lost. His Clark felt larger than life and grounded (no pun intended there) at the same time. His Lois Lane was stunningly beautiful, but never in a cheesecake sort of way. She had a lot of personality that came through in the art. The action was intense and the more intimate scenes, like the one between Superman and Lex at the end, felt just as epic. I liked that they included some of Castellini's Superman commissions throughout the special. We never really saw Superman in a traditional way, so seeing those commissions gave us that without sacrificing the story Wolfman was trying to tell. Cover Art - 5: This is a deceptively simple cover, but it says so much and fits the story perfectly. 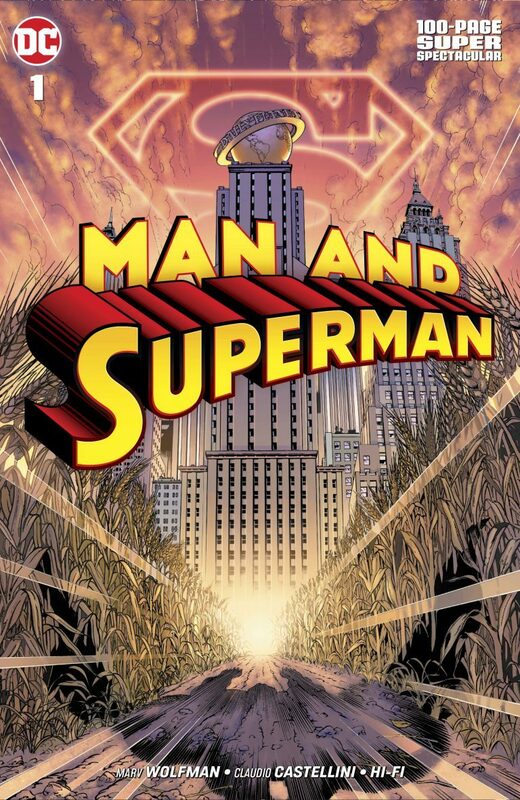 You see a cornfield leading to a city with the shadow of Superman flying towards the Daily Planet. Behind the Planet building is the S symbol but more importantly a sky lit up with the rising sun. Everything about this image says that Superman is flying towards the dawn of his career. Could they have gone with a hero shot of Superman? Yes, but this works so much better.